Warranty : 1 year manufacturer warranty. Washing Machines have become important in every household. They come handy not only when your domestic helper is on leave, but also when you have buckets of clothes to be washed in short time. 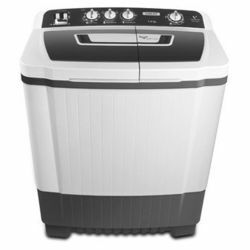 Videocon, the popular company has introduced many models of washing machines. One such machine is 7.6 kg Virat Semi Automatic Washing Machine, which has an interesting feature of 'Air Dry' where the machine blows atmospheric air to a spinning tub through the uniquely designed spin lid to make clothes extra dry. Other attractive features are – Magic Filter, Air Dry, Centre Fall Spin Shower Rinsing, 2 Water Falls, Buzzer, Collar Scrubber, 3 Wash Program and Anti Rust Plastic Body. Washing Machines have become important in every household. They come handy not only when your domestic helper is on leave, but also when you have buckets of clothes to be washed in short time. Videocon, the popular company has introduced many models of washing machines. One such machine is 7.6 kg Virat Semi Automatic Washing Machine, which has an interesting feature of 'Air Dry' where the machine blows atmospheric air to a spinning tub through the uniquely designed spin lid to make clothes extra dry. Other attractive features are – Magic Filter, Air Dry, Centre Fall Spin Shower Rinsing, 2 Water Falls, Buzzer, Collar Scrubber, 3 Wash Program and Anti Rust Plastic Body.